Watch as travel expert, video journalist and contributor to Tripfilms.com, Kelley Ferro explores Australia’s Northern Territory. 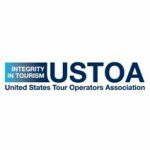 Touring with USTOA Member Goway Travel gave Kelley access to local guides, unique wildlife and once in a lifetime experiences that make this region one of the most culturally rich in the world. 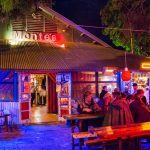 Highlights of the trip include hiking through the vast Kings Canyon, visiting Uluru -Kata Tjuta National Park and sampling the local cuisine throughout. I told Goway Travel and the Tourism Northern Territory crew that I am as brave as they come; I’m willing to stare two-pronged danger in the face, go toe-to-toe with crocodilian terrors, and dance with thorny mayhem – so long as it’s behind three inches of safety glass. That’s how I ended up at the Alice Springs Reptile Centre, shoulder to shoulder with owner Rex Neindorf’s fantastic collection of slithering, slinking Outback wonders. Read the full post here. Expectation has a way of bringing travel into perspective. But when expectation is paired with long-distance travel – in the case of my trip to Australia’s Northern Territory, a 14-hour jaunt book-ended by a pair of 4-hour flights – expectation also can shape the way you think about place and space. Read the full post here. Never have I been anywhere that has more “sky.” I know what you are going to say— “every place has the same amount of sky” but trust me, when you are standing in the desert of the Northern Territory, you might rethink that statement. Read the full post here. I told Goway Travel and the Tourism Northern Territory crew that I am as brave as they come; I’m willing to stare two-pronged danger in the face, go toe-to-toe with crocodilian terrors, and dance with thorny mayhem – so long as it’s behind three inches of safety glass. That’s how I ended up at the Alice Springs Reptile Centre, shoulder to shoulder with owner Rex Neindorf’s fantastic collection of slithering, slinking Outback wonders. Less a zoo and more an educational outpost, the Reptile Centre is an excellent introduction to the fauna of the Northern Territory, and an opportunity to debunk some of the myths surrounding Australia’s misunderstood animals – though I never did get comfortable enough to give Terry the saltwater crocodile a kiss on the lips. 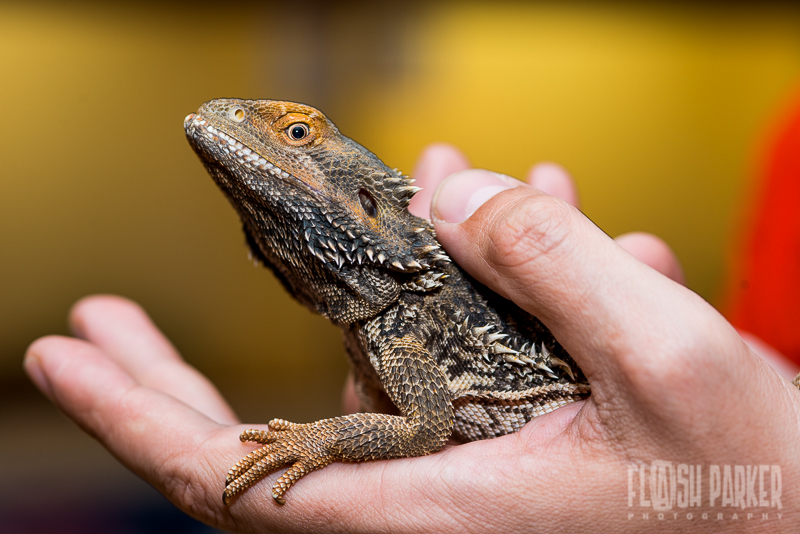 Rex, who has been performing reptile shows in Alice Springs since 1997, even allowed me to tag along on a reptile call-out, where he rescued a western brown snake from a local lady’s living room, and spared here toes a bite from one of the country’s most venomous snakes. With the Reptile Centre serving as the perfect primer, we set off into the Outback, the landscape cast in muted tones due to an uncharacteristic rain that lent the scene an air of mystery. We ripped along the Stuart Highway for a few hundred kilometers – if there is a longer, straighter road anyplace on this earth, I have never seen it – glimpsing kangaroos and camels through the rain streaked glass. We arrived at the Kings Canyon Wilderness Lodge at Kings Creek Station for a posh Outback dinner capped by Port and marshmallows around the fire, and weighed the pros and cons of staying up all night telling stories by the fire against retiring to our glamping digs in order to get an early start at Watarrka National Park. The compromise included drinking wine by the fire until after midnight, then rising to shine just a little after 5am – a win-win situation all the way around. The sun decided to join us shortly after 7am the next morning, when we were standing on the rim of the massive Kings Canyon, at the heart of the national park. It’s easy to feel small in a place this big; the canyon walls tower more than 100 meters above the valley floor, concealing a lush forest that’s home to more than 600 species of plants and animals. 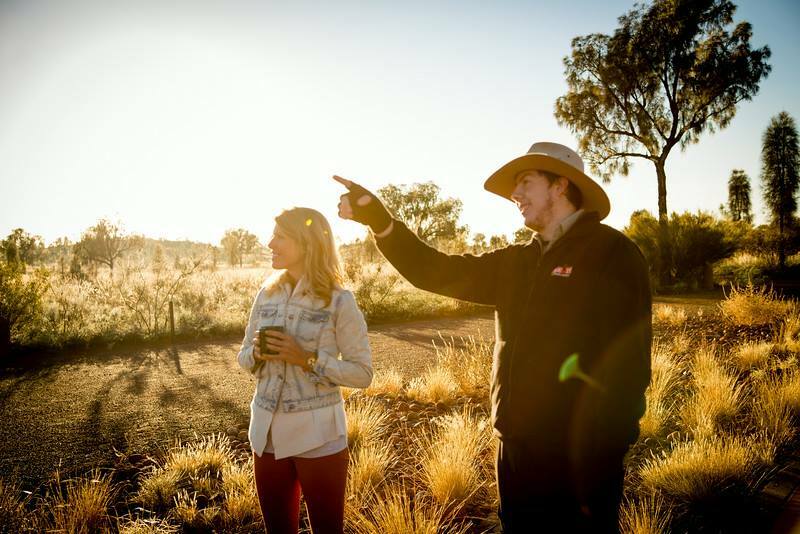 Our outstanding guide added plenty of color to the experience by regaling us with Outback lore, tales of the local Luritja people, and true-ish stories of the drop bears that may or may not haunt the valley. I didn’t personally come across a drop bear, but that doesn’t mean they’re not real. 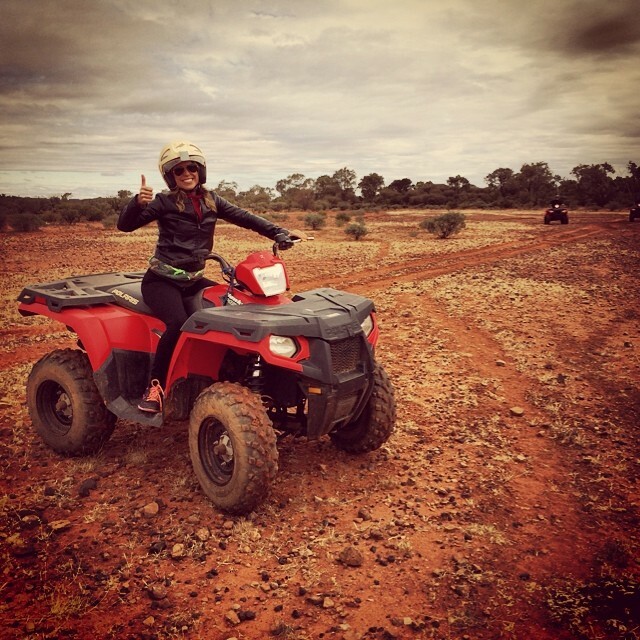 I did come across a bit of bonafide Outback adventure on a quad bike at Kings Creek Station, setting a new personal speed record while zipping over dusty dunes of falu red. I won’t tell you how fast I went – trust me, it was super fast – but I will tell you that I tore into our Outback campfire cookout with reckless abandon; a lamb shank never has tasted so good. Camp was made in the crook of a giant rock – complete with cave, rife for exploring – and was hosted by a pair of cattlemen from the Station, whom captured our attention with tales of life lived in the wild. I dare anyone to visit this place for more than a few hours and not consider breaking free of the husk of the everyday to live free under the big skies of the Northern Territory. 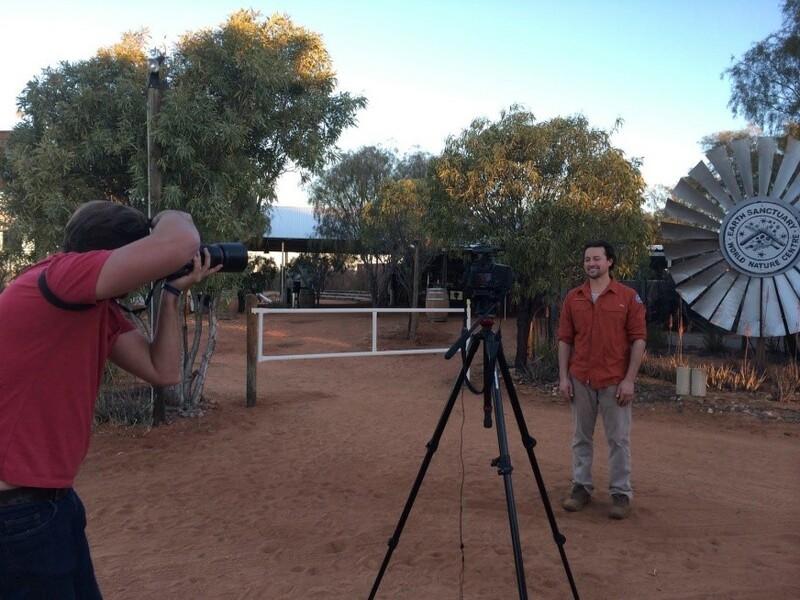 For highlights of Flash Parker’s tour through Australia’s Northern Territory, click here. Flash Parker is an AFAR Ambassador, photographer, travel writer and author from Toronto, Canada. His work has been published by Lonely Planet, Conde Nast, Canadian Living, USA Today, Get Lost Magazine, GQ Magazine, Asian Geographic, Escape Magazine and more. Follow Flash Parker on Twitter, Facebook, Instagram or on his website. Expectation has a way of bringing travel into perspective. But when expectation is paired with long-distance travel – in the case of my trip to Australia’s Northern Territory, a 14-hour jaunt book-ended by a pair of 4-hour flights – expectation also can shape the way you think about place and space. Flipping through the pages of the remarkable itinerary prepared for me by the folks at USTOA, Tourism Northern Territory, and Goway Travel, I began comparing the unseen Australia to my own Canadian homeland, if for no other reason than to ground my trip on experience I already understood; I’m big on wide open spaces, the sort of which both Canada and Australia boast in spades. I’m comfortable in the Wild, in places where bison outnumber people, and was excited about arriving in the Outback, where I expected camels and kangaroos to outnumber man five-to-one. I like to think of myself as the rugged frontier type, always game for an adventure, and couldn’t wait to exchange knowing glances with the Paul Hogan-esque wardens of the Outback. Sure, my knowledge of Australia begins and ends with Crocodile Dundee, bushranger Ned Kelly, and poet Banjo Paterson, but there are worse icons to idolize. 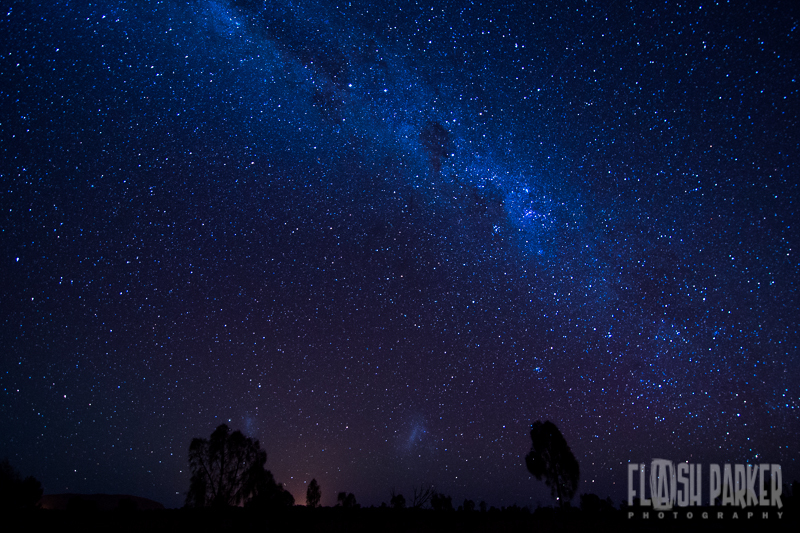 I was promised camel rides up and over desert dunes; campfires and cookouts under starry skies; and a glimpse at the Australia rarely seen. In short, I was set to experience the NT the way locals see it, and I’d have ample opportunity to compare the Oz in my head to the Oz in my heart, though I promised myself, under no circumstance whatsoever, would I at any point on this trip discuss shrimp on the barbie, dingos and babies, or the abomination that was Mick Dundee in LA. As my plane bumped across the tarmac at the Alice Springs airfield, I scrawled this promise across a page in my notebook, and underlined it twice in red ink. I polished off the last of my James Boag Lager, and set forth for adventure. “… so I took a nasty bite from that big bugger, and that’s when I decided to give up spearfishing down south, and move to the Northern Territory for a look at the quiet life,” Laurie said, as he spirited me away from the airport and off into the NT’s red sand. I’d amused Laurie by trying to get into the driver’s seat when he picked me up – “you’re not driving my bloody car, I just had it washed,” he said with a smile – and we’d become fast friends. At first I thought someone from Goway Travel was putting me on; Laurie was so hyper-Outback that I thought he might have been a hired hand. But after twenty minutes together, I realized he was just a genuine bloke with a story to tell. “Mate,” he said, as he dropped me off at the gates of the Camel Cup, “you call me if you need a ride anyplace – even if you need a lift all the way up to Darwin, ‘cuz I got some family up there – or if you just feel like shooting the breeze. You’ve got my number.” And with that Laurie was off like a shot, no doubt to spend his day boxing kangaroos and wrangling venomous snakes. And there I was, on the doorstep of my first great Outback experience. With abandon I stepped through the gates at Blatherskite Park and into a world of camels, sand, and costumes. 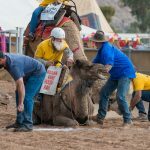 I arrived in time for the Ms Camel Cup pageant, and was gobsmacked by peacocking ladies in full flight. 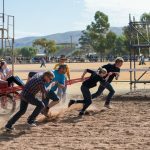 The young and young at heart loaded their partners into antediluvian rickshaws for a zip around the dusty track, while something called the Honeymoon Handicap captured the attention of the 5,000 folks in attendance. Would-be husbands raced their snorting camels half way around the track, where they popped off, hoisted their future wives aboard the beasts, and continued on toward the finish line. All this before one of the “proper” races had been run. My first impression of the Northern Territory is certainly one I’ll never forget. Ah, but those races! Gallant riders atop ornery steeds – some significantly more ornery than others – spiriting around the track in the pursuit of glory. At one point I was convinced I saw Santa Claus, mounted atop a yellow camel, being chased by a viking riding a brown camel. The moment was singularly captivating, difficult to express in words or images. You really had to be there. I realized in that moment that this was exactly what this trip was all about; the being, the experiencing, and the doing. Be there I was, indeed; I can’t remember another trip where I felt so wrapped up in the moment. Goway Travel and Tourism Northern Territory thrust me in the center of the action. I was more than a spectator; had I told my guide I wanted to race, I probably would have been given my own camel (for the record, I didn’t ask, for fear of a positive response). I spent an incredible afternoon watching these massive “ships of the desert” sail across the Outback, marveled at the skill of some riders, and giggled at the utter terror strewn across the faces of others. I was caught firmly in the grip of even-toed ungulate madness, and toasted my good fortune alongside other revelers at the Lasseters tent, where post-race conversations ranged from “did you see that,” to “I can’t believe when…” The guests in the tent, probably more than a hundred strong, seemed to be split evenly between foreigners and visiting Aussies, each of us grinning slyly like we were in on some precious Outback secret. In more than one way, we were. I couldn’t have wished for a better way to kick-start my adventures Down Under. The Goway Travel operators and Tourism Northern Territory had promised a truly unique Aussie experience – one that was “fully customizable.” Instead of itineraries carved from granite, my outfitters worked with me on making sure I got the most out of my time in Australia; they asked what sort of things I wanted to see and experience in the Outback, filling in the gaps with their fantastic local knowledge. 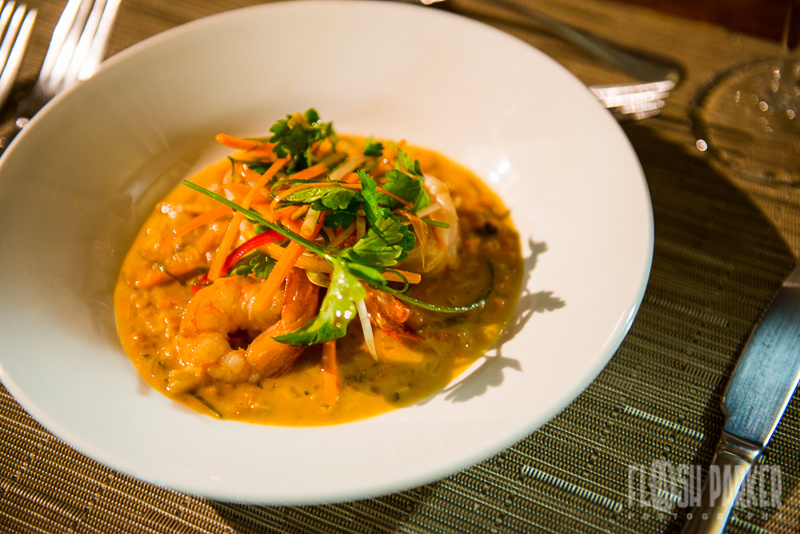 That’s how I wound up deep in Thai bliss at Hanumans, Alice Springs’ finest upscale dining option, and toasting NT craft brews under the outdoor heaters at Monte’s, the social center of the town (as far as I could tell). 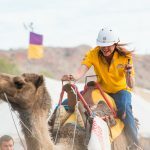 Half a day with Goway Travel and Tourism Northern Territory and I had already sipped handcrafted suds, made fast friends with the local folk, and witnessed Santa Claus fall off a camel – the holy trinity of experiential travel. I expected this trip to be good, but should have listened carefully when they told me to expect the adventure of a lifetime. To think, the first day had barely come and gone. Never have I been anywhere that has more “sky.” I know what you are going to say— “every place has the same amount of sky” but trust me, when you are standing in the desert of the Northern Territory, you might rethink that statement. As I stepped onto the tarmac in the Northern Territory, I felt like I had just stepped onto a different planet. The Earth was glaringly red, sharp mountains jutted out of the expanse of desert, the trees looked like they had withstood millenniums and the sun was so bright it hurt my eyes. This place felt like it had seen the dawn of time—it felt ancient and primal. However the people of the Northern Territory could not have been more vibrant, youthful and fresh. 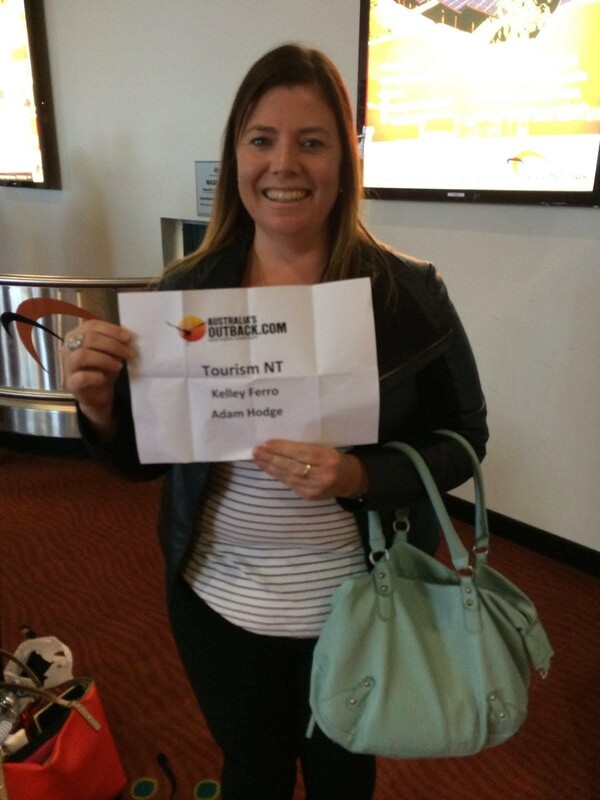 Kirsten, our Northern Territory guide, welcoming us at the airport. I was met at the gate with the biggest smiles and that warm, welcoming feeling continued throughout the trip. The Northern Territory Aussies were just happy to have us there. Everyone seemed so healthy and full of life and very much in tune with the natural surroundings. I was blown away by the nonchalance of Rex the Reptile Hunter, who cracked jokes while catching a lethal Western Brown Snake slithering by our feet. I listened to stories from the trio of brothers at Earth Sanctuary who knew just about everything about the sustainable living in the Outback. And I can’t leave out Mark, our cameleer and owner of the Camel Farm, whom I swear was having conversations with these leggy creatures as we rode across the plains into the sunset. This dry Outback sustained so much life and much of it was not in human form. One of the three brothers that run Earth Sanctuary. I had ridden a camel on a previous USTOA adventure in Egypt, so I assumed that I knew basically all that what was need to know about camels. They make funny, Chewbacca-like* sounds, they look at you as if they are unimpressed and they are really, really tall—much taller than any horse. 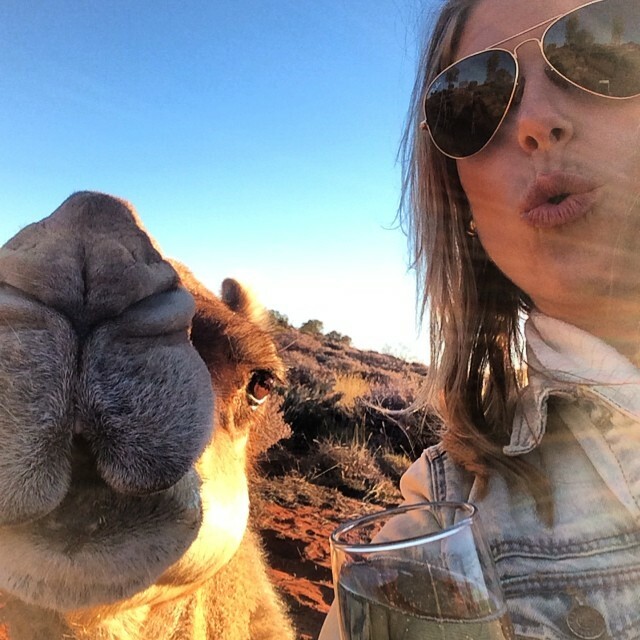 But it wasn’t until I was plopped in the middle of Australia, in the expanse of beautiful Outback that is the Northern Territory, that I realized camels are SO much more. Wally & I, ready for our jaunt into the desert. Camels are not native to Australia, they were introduced in 19th century to help build up central Australia as their hardy nature makes them perfect for the harsh desert climate. When they were no longer needed, they were let go and these dromedaries flourished. At one point there were over one million feral camels across Australia. (Disclaimer: I learned all of this while watching Australia’s new hit movie, Tracks, on the plane. Tracks details the solo journey of one woman and four camels across the unforgiving outback and it’s a very good watch). All this feral camel information came in handy when I was 4 wheeling through the remote Kings Canyon. Our guide casually told us to watch out for wild camels as he sped off. 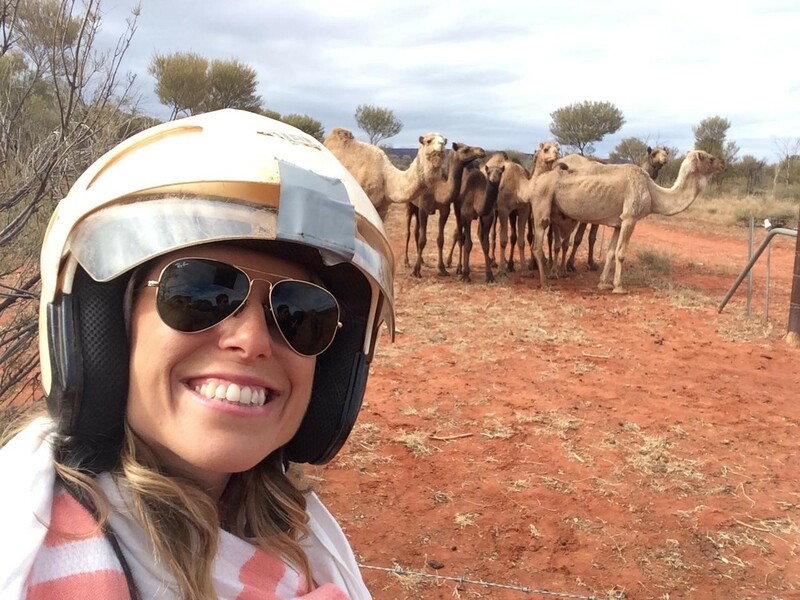 I was expecting lizards or maybe a bird, but it’s not every day that you are dodging camels while racing through the Outback on a quad! Though feral, these camels that we stumbled upon were so cute! 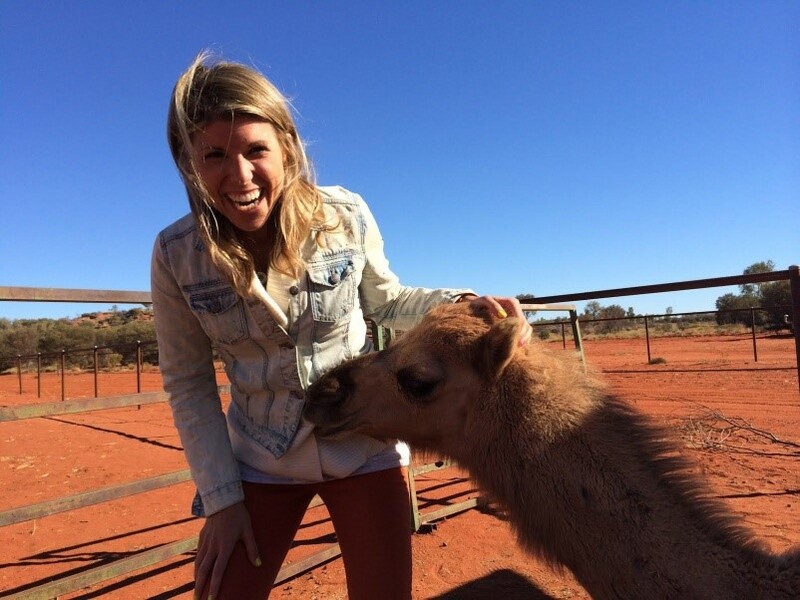 Besides being important in developing the Northern Territory, camels are also loved for sport. 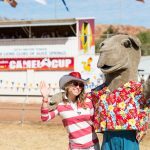 Alice Springs hosts an annual Camel Cup, where the fastest camels come to race for the grand prize. I once thought that these lumbering beasts could only chew their cud sideways and amble on their bony legs. I was wrong. These beasts can move! When they were speeding around the track, they were quite a dramatic spectacle. 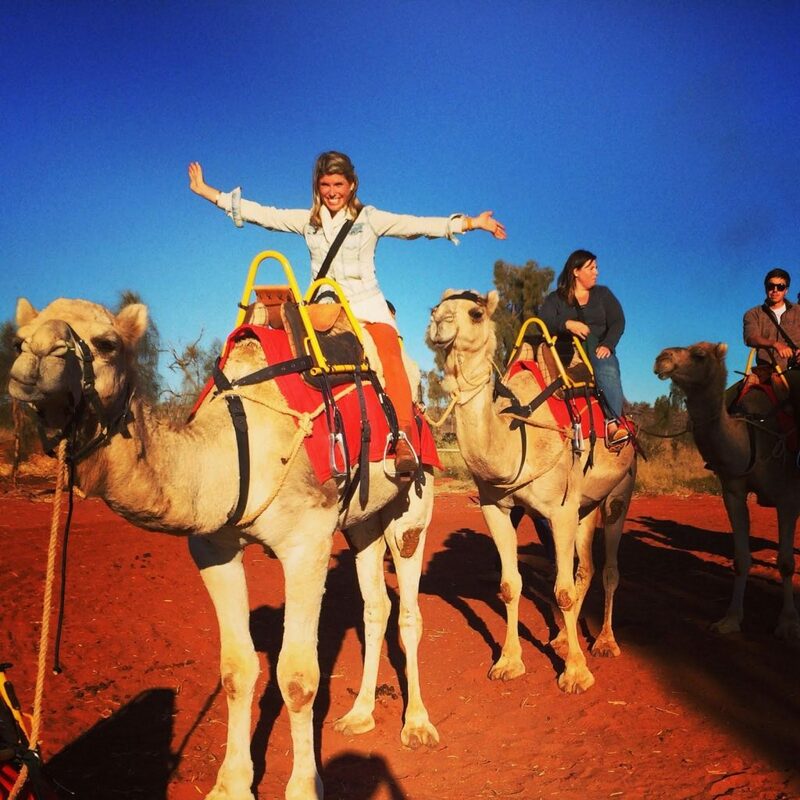 In addition to the races, there’s plenty of camel related entertainment for everyone. From the dancing camel mascot, to the human rickshaw races (we came in dead last) to the food-filled fairground atmosphere. 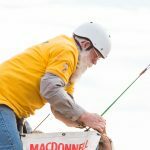 Aussies come from far and wide to attend this camel fueled day. And the icing on the cake? 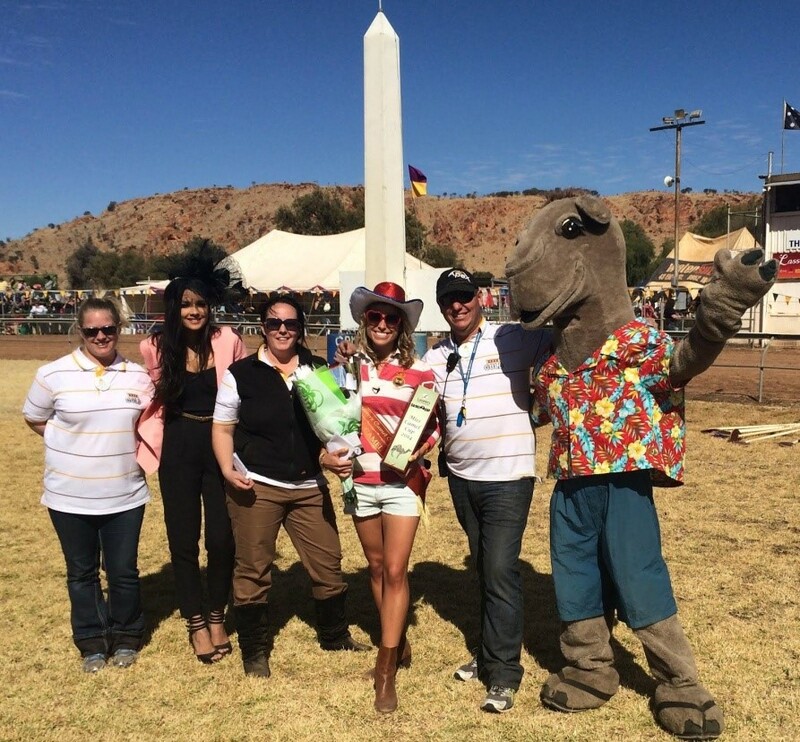 While donning my most American get up, I was honored to be crowned Miss Camel Cup by Australia’s famous Big Brother star, Tahan. Holding my winnings as Miss Camel Cup! 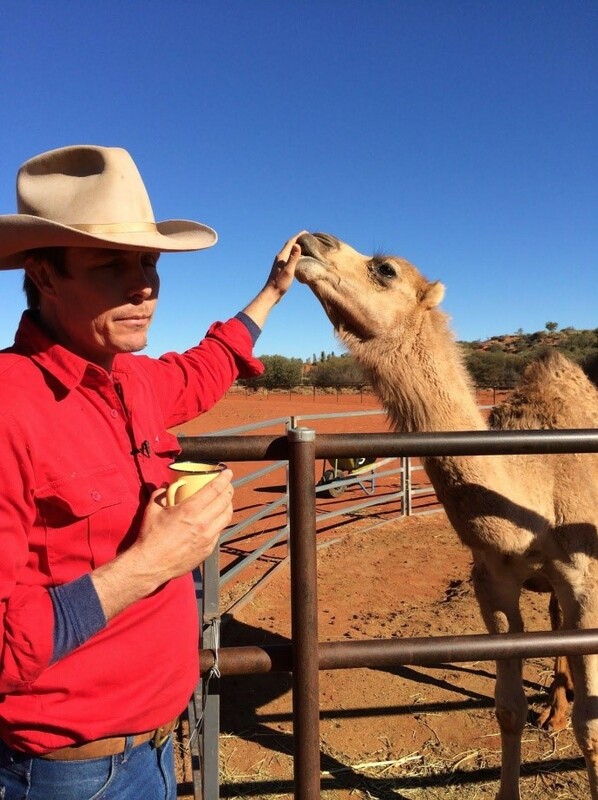 I held a python, I took a photo of the horned lizard up close, I smiled face to face with a crocodile, and I fell asleep to the lullaby of the dingos outside of my tent, but I can’t deny that my favorite Northern Territory experience did indeed involve the camels. 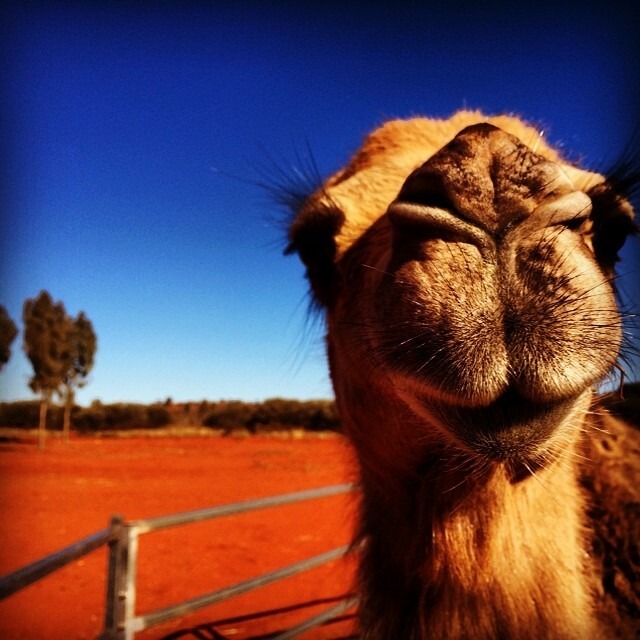 At the Uluru Camel Farm, I learned that each camel has his or her own personality. 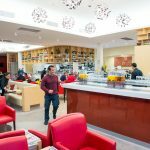 The owner, Mark, explained that some are mischievous while others just want to play, some are stubborn and some require humans to earn their love. The baby of the farm was named Milkshake. Unlike her fellow brethren that were caught in the wild and trained to take guests on tours, Milkshake was born on the farm and hand-reared by the cameleers. She thought she was a human and she had no qualms about getting friendly with all humans around her. She also seemed to be a bit of clotheshorse (see below). Milkshake really liked to nibble my jacket and shoes. 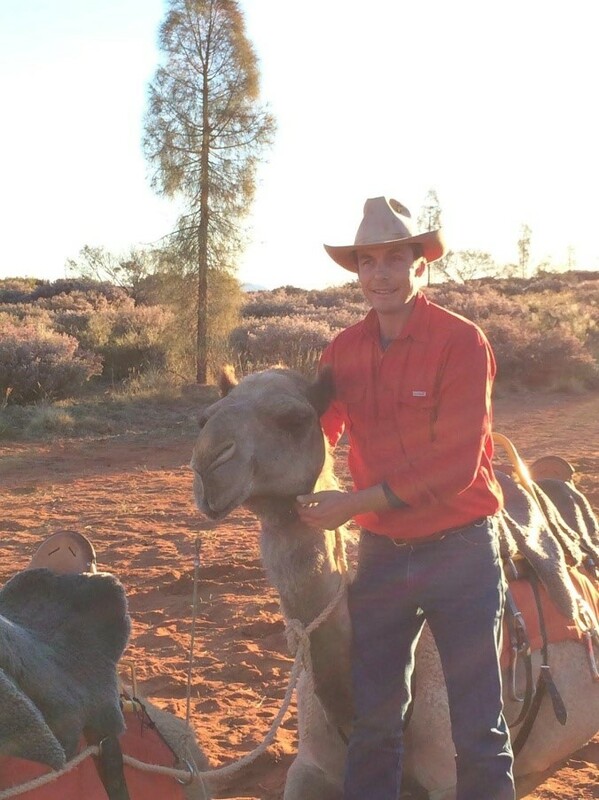 Mark led us on a camel ride at sunset and these slow moving vehicles made me turn into a lower gear and breathe in the intricacies of Outback life. Sitting on top of Wally, a recently caught and trained camel, I realized how life out here was so synchronistic. 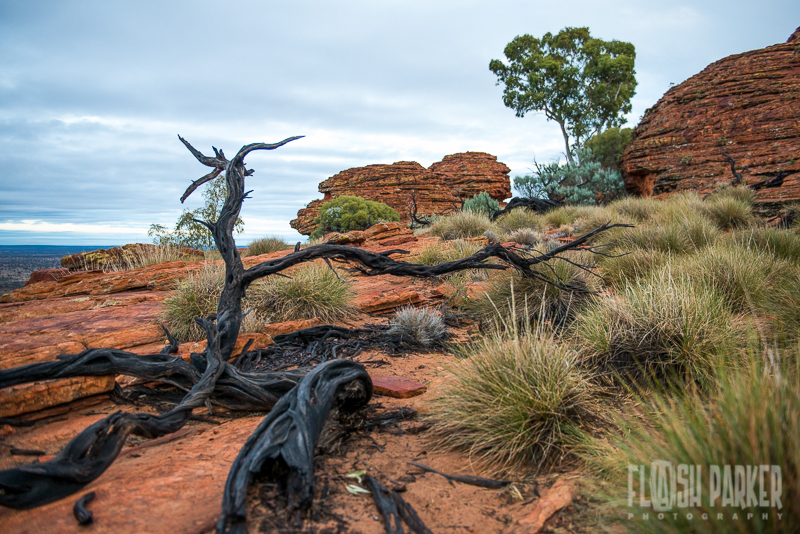 Every plant, animal and human had to work together to survive in the stunning but severe landscape of the Outback. And as Wally and I ambled into the sunset, I felt like I was a part of that balance for just a brief moment in time. *Little known fact: Did you know that the voice of Chewbacca in “Star Wars” was actually made by a camel? Learning about the Aboriginal stories at Uluru (Ayers Rock) on an early morn in the Outback. Meet Wally, my ride to dinner. Not the fastest or most comfortable ride of my life but it was definitely the most memorable! Her name is “Milkshake” & she us a diva. She kept eating my shoes & nuzzling me to pet her. Who needs a dog when you can have a pet camel!